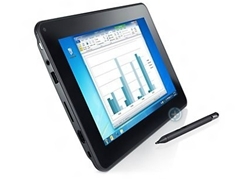 You’ve probably heard Dell is developing a Windows 8 tablet, code named Latitude 10. A leaked image of what just may be the device has appeared in Neowin. From what I can see, the design is similar to other tablets. The HD display measures 10.1 inches, comes with multi-touch, supports 1366 x 760 resolution and can be paired with an optional stylus. That feature is just like the Galaxy Note 10.1. Latitude 10 appears to feature Intel’s Clover Trail Atom dual core processor, which also integrates Intel Integrated Graphics, 2 Gb of DDR-II 800 Mhz RAM and, surprisingly, up to 128 GB of SSD memory-using eMMC chips. On the front is a 2-megapixel camera, on the back an 8-megapixel camera. Connectivity features include Wi-Fi, Bluetooth and mobile broadband options. Dell Latitude 10 is expected to come in two versions: One will feature a two-cell battery, while the other is expected to carry four cells and deliver up to 10 hours of life. The battery is swappable, so you can replace it or upgrade it whenever you want. The leak seems to be legit, but unfortunately it doesn’t indicate when we may see the Windows 8 tablet in action. My hunch is this will announced toward the end of the year.